Hopes Rise for Improved U.S.-Syria Relations Syria and the United States are weighing a new relationship after years of mutual distrust. The fragile opening came last month, when the Bush administration invited Syria to attend a U.S.-sponsored conference to revive negotiations between the Palestinians and Israelis. 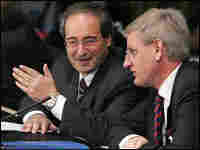 Syrian Deputy Foreign Minister Faisal Mekdad (left) talks with Swedish Foreign Minister Carl Bildt on Nov. 27, 2007, during the Middle East peace conference in Annapolis, Md. 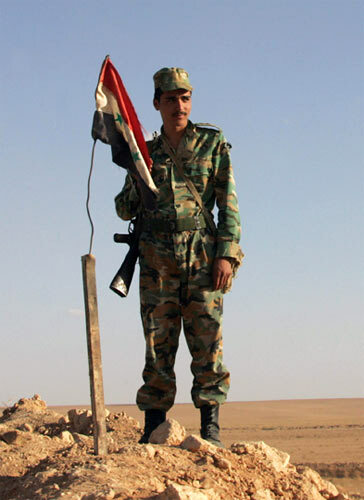 A Syrian soldier guards a desert border post between Syria and Iraq in November. The Syrian government took a delegation of diplomats and journalists on a tour of its border with Iraq, aiming to dispel U.S. accusations that Syria fails to stop foreign fighters slipping through its border to fight in Iraq. 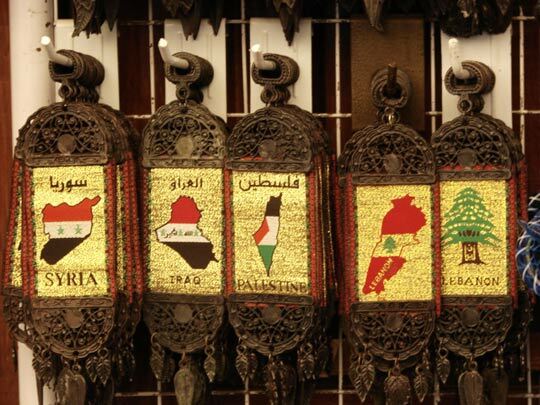 These trinkets at a Damascus market seem symbolic of Syria's central role in the region's conflicts. Syria and the United States are weighing a new relationship after years of mutual distrust. The fragile opening came last month, when the Bush administration invited Syria to attend a U.S.-sponsored conference to revive negotiations between the Palestinians and Israelis. Syria has been under intense U.S. pressure for its role in the Palestinian territories — in Iraq and Lebanon. Some officials in the Bush administration advocated regime change in Damascus. But now there is a change in tone. This week, U.S. Secretary of State Condoleezza Rice spoke of Syria's regional role in unusually positive language. "Well, I hope it will be a helpful role," Rice said. "Everyone understands that Syria is a party to the conflict." In Damascus, there's hope that Syria's isolation by the United States and U.S. allies may be coming to an end. There were positive signals on state-run television, which highlighted a U.S. cultural exchange — the first in years — as the top item on its English-language news broadcast. "I don't want to speculate that the visits of artists are big deals always," said Faisal Mekdad, Syria's deputy foreign minister. But he added, "It's our hope that a new page is turned for better U.S.-Syrian relations." Mekdad attended the Middle East peace conference in Annapolis, Md., where he shook hands with Rice. He said he told her that Syria wants to be part of a Middle East deal. 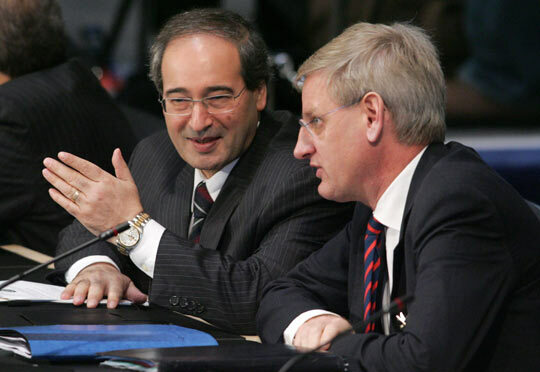 "The role of Syria is pivotal," Mekdad said. 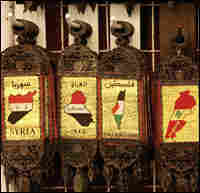 "To our east there is Iraq, the south Israel, to the west Lebanon ... where the United States is claiming it has major interests. And without discussions with Syria, it will be very difficult to solve any of these problems." Ahead of the Annapolis meeting, a stream of high-profile visitors came to Damascus to try to persuade Syria to take part, said Rob Malley of the International Crisis Group. Malley said the Bush administration was divided over Syria's invitation. The case was made by U.S. allies. "Palestinians, the Arabs — Saudi Arabia in particular — even Israel, were all lobbying the U.S. to invite Syria, each for [their] own reason," Malley said. "So I think ultimately, the Bush administration was convinced by the others who were crucial to Annapolis that it was better to have Syria in than out." It is recognition that all the conflicts in the region are now interconnected — Lebanon, Iraq, Palestinians and Israelis — and that Syrians play a role in all of these places, journalist Ibrahim Hamidi said. "They have a role to play, OK. But if you don't talk to the others ... you cannot play your role," Hamidi said. "So I think the Syrians were more moderate, more flexible in their demands and this is why, in a way, they attended Annapolis." The Syrians have been more flexible on a number of key issues, said Peter Harling, a Middle East analyst based in Damascus. "Syria over the past few months has been making a number of signals," he said. For example, it has been moving toward closer ties with the U.S.-backed Iraqi government, including more cooperation on the Iraqi border — a key demand of the Bush administration, Harling said. Syria has shut the transit route for Arab militants on the way to Iraq, he said. In neighboring Lebanon, Syria helped break a political deadlock by backing a consensus candidate for president. Syria supports a coalition that includes Hezbollah, which has been in a standoff with the U.S.-backed Lebanese government. It is another sign of a new approach, said Andrew Tabler, an American journalist based in Damascus. "Syria perhaps wants to show that it is able to move quickly," Tabler said. "So, if you're reading the signs, and you look at Lebanon, you can see which way the winds are blowing between Damascus and Washington." No one in Damascus expects a dramatic thaw with the Bush administration. Western diplomats talk of modest prospects. They note that Syria remains in an alliance with the most anti-American elements in the Middle East — Hezbollah, Hamas and Iran.